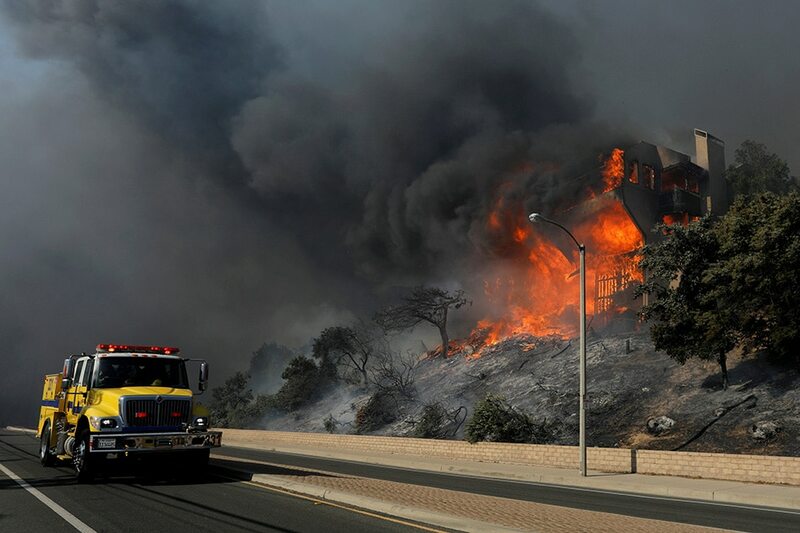 FARIA BEACH, CALIFORNIA - Wildfires roared through canyons, hillsides and residential areas in densely populated Southern California for a fourth day on Thursday as gusting winds hampered efforts to quell the flames. Some 200,000 people have evacuated ahead of the fires, which have destroyed hundreds of homes and forced hundreds of Los Angeles-area schools to close. Authorities feared the 4 major fires - ranging from Los Angeles up the Pacific coast to Santa Barbara County - would be whipped up by the region's notorious westward Santa Ana winds that could reach hurricane strength. The winds, which blow in hot and dry from the California desert, could reach 75 miles per hour (120 km per hour) on Thursday and create "extreme fire danger," according to an alert sent by the countywide emergency system in Los Angeles. The National Weather Service said high winds were expected to continue at least through Saturday. North of San Diego, another blaze called the Lilac Fire grew from about 10 acres to between 100 and 150 acres in less than an hour, destroying two structures and prompting evacuations, the local CAL FIRE agency reported. About 100 firefighters fended off flames in the seaside enclave of Faria Beach, caught between burning mountains and the Pacific Ocean, northwest of Ventura. Fires spread down the smoking hills, jumping the heavily used U.S. 101 highway, and headed toward clusters of beach houses. Firefighters lined up along a railroad track, the last barrier from the flames. Surrounded by strong winds and smoke, Songsri Kesonchampa aimed a garden hose at a large pine tree between her Feria Beach house and the fire, attempting to fend off disaster. “If this tree catches fire, the strong wind will blow the flames towards my house. I need to protect this tree,” she said. “In the 10 years I’ve lived here, I have never seen anything like this,” she added. As she spoke, a sheriff’s car drove by, ordering residents to evacuate. “The fire is here. You must evacuate your homes right now,” an officer said over the loudspeaker. Nearby, Ventura resident Shana Dalton was checking on her friends’ house. “One minute the flames were on the mountains and then next thing you know, they jumped the 101 and the train tracks and were right in front of us,” she said. Because of the heavy smoke, the South Coast Air Quality Management District warned residents, especially the elderly, children, pregnant women and people with respiratory diseases, to stay indoors. Ventura County authorities said air quality in the Ojai Valley area was hazardous with "numbers ... off the charts." The Thomas Fire, the largest in the area, continued its westward push on Thursday, forcing the evacuation of hundreds of Santa Barbara County residents and the closing of Highway 101 north of Ventura city. The fire has destroyed more than 150 homes and threatened thousands more in Ventura. In the San Fernando Valley north of Los Angeles, the Creek Fire destroyed at least 30 homes, blackened more than 12,000 acres (4,800 hectares) and forced the evacuation of 2,500 homes and a convalescent center. Another blaze, the Rye Fire, threatened more than 5,000 homes and structures northwest of Los Angeles. The Skirball Fire in Los Angeles has forced hundreds of residents in the wooded hills near the Bel-Air neighborhood to evacuate and charred more than 475 acres (192 hectares). Skirball threatened media magnate Rupert Murdoch's Moraga Estate winery. The property was evacuated, with possible damage to some buildings, Murdoch said in a statement, but “We believe the winery and house are still intact." The Los Angeles Police Department tweeted "LAPD Working to Save Every Californian, Pets Included" along with a photo of a police officer in a respirator rescuing a cat. The Los Angeles Unified School District, the country's second largest with more than 640,000 students, said it closed at least 265 of its nearly 1,100 schools. The University of California Santa Barbara canceled classes as well. Dozens of schools also were closed in Ventura County, where the Thomas Fire has charred more than 96,000 acres (38,850 hectares). The school district, with nearly 17,000 students, hoped to reopen on Monday. San Diego Gas & Electric said it was turning off power to customers in some mountain communities northeast of San Diego to lessen fire danger and warned the outage could last several days.